Bihar Deputy Chief Minister Sushil Kumar Modi has recently announced that the Dolphin Research Center will be established in Patna. It will be Asia's first Dolphin Research Center, which is being built on such a large scale. Construction work of National Dolphin Research Center, which will be constructed at a cost of around 28 crore rupees, will be started soon. This centre will be built on two acres of land in Patna University campus. Apart from this, an 'Observatory' is being constructed in Munger, from where dolphins can be seen. Arrangements will be made to see the dolphins going to the river Ganga soon. For information on the number and availability of dolphins, the work from Chausa to Sahebganj will be done at the cost of 42.728 lacs from three prestigious institutes from November 15 to December 15 this year. In Bihar, a film on Dolphin is also being built at a cost of Rs 10 lakh and immunization co-promotions program is being organized to reward the people saving dolphins. The role of this centre will be important in the efforts of dolphin conservation. The dolphin population is constantly decreasing. 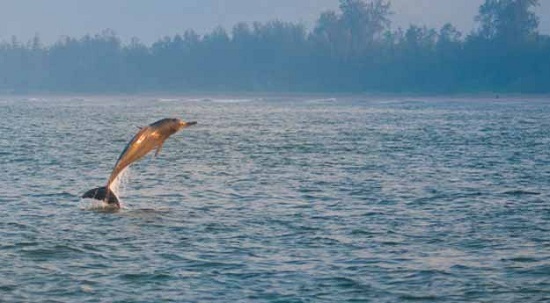 Almost half of India's dolphin population is in Bihar, the estimated population of the country is about 3,000 dolphins.